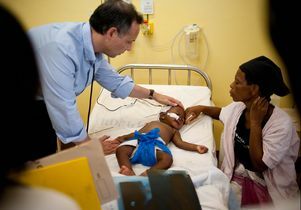 Dr. Lee Miller cares for a sick child in Mozambique. Dr. Lee Miller’s journey began, as many do, with a train ride. Thirty years ago, he was a UCLA assistant professor traveling from Philadelphia to New York. After threading his way through the crowded aisles of every car, he eyed the last three vacant seats in the caboose. The ride passed quickly as the older physician recounted stories about his work in global health. When the two exchanged business cards at the end of the ride, Miller was astonished to learn that he’d been chatting for two hours with Dr. Hu Ching-Li, assistant director general of the World Health Organization. That chance encounter with Hu led Miller to take a sabbatical from UCLA four years later to join the WHO, where he worked on a medical education project at the agency’s headquarters in Switzerland. Traveling frequently from Geneva to lead medical school workshops in countries like Egypt, Ethiopia, Myanmar and Zambia, this work provided the foundation for Miller’s later career consulting in Afghanistan, Ecuador, Mozambique, Peru and South Africa. In his 32-year distinguished career as a pediatrician and global health advocate, Miller has quietly made it his mission to address health care disparities in developing countries while inspiring the next generation of young physicians to follow his example. Miller, who mentors students and residents in his role as associate dean for student affairs at the David Geffen School of Medicine at UCLA, was invited by the UCLA medical student chapter of the Gold Humanism Honor Society to share the pivotal experiences that shaped his professional life. Miller in a pediatric clinic in a village in Mozambique, Africa. The sabbatical he took in 1994 coincided with the end of the civil war in Rwanda that August, when millions of ethnic Hutus fled their homeland to escape genocide by Tutsi extremists. Traveling by foot and acutely weakened by shock, fatigue, hunger and thirst, the survivors sought sanctuary in a refugee camp in Zaire, now the Democratic Republic of the Congo. When Miller arrived at the camp, he confronted unspeakable scenes of human suffering. Because the region’s volcanic ground prevented the digging of latrines and graves, human waste and corpses slid into Lake Kivu, contaminating the refugees’ only drinking water. Dysentery and cholera swept through the camp. Cases of meningitis broke out, forcing doctors to perform spinal taps on people lying in the dirty grass. All told, starvation, dehydration and disease killed 2,000 children and adults each day in the camp. “We would wake up early, grab coffee and a muffin, and then a truck would drive us to the refugee camps,” Miller said. “Every morning, we rolled over children’s bodies to check if they were still alive. Frantic mothers surrounded us, begging for water for their own children, yet we only had enough to give to the sickest children. “The experience remains indelibly imprinted upon my mind,” he said. Over the duration of his stay, the number of people dying in the camps dropped from 2,000 to 500 per day — still an unfathomable loss of life. Shaken by the horrors he’d witnessed, Miller was unable to discuss his experience for several years. Upon his return to UCLA, he poured his energy into two new outlets. He co-founded the medical school’s global health education program, where he still serves as its director of overseas educational programs for medical trainees. And in partnership with UCLA’s Mattel Children’s Hospital and pediatrics department, he launched Partners for Pediatric Progress, a non-profit dedicated to improving children’s health care. Its mission is to strengthen low-income communities’ ability to deliver health care by training local physicians to teach the next generation of health care leaders. 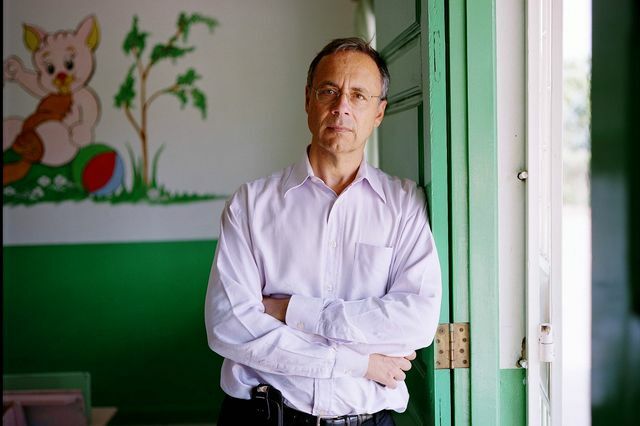 “Our students and residents come back changed,” said Miller, 12-time recipient of the Geffen School of Medicine’s Golden Apple Award for Excellence in Teaching (which is voted on by students), the 2013 Humanism in Medicine Award from the Association of American Medical Colleges, and the University of California’s Academic Senate Distinguished Teaching Award. Miller, second from right, and Dr. Ryan Coller in Peru conferring with colleagues. During his speech, Miller described the story of Ryan Coller, then 25, who in 2009 was the first UCLA trainee to work in the children’s hospital in Mozambique, one of the poorest countries in the world. One day the third-year resident noticed a 2-year-old boy who had stopped breathing. He resuscitated the toddler, performed chest compressions and prepared to slide a tube into his throat to prepare him for artificial ventilation. When the battery died on the laryngoscope, he ingeniously replaced it with a battery from the Walkman in his backpack. Finally, he asked the medical team to bring a ventilator. Coller decided the best gift he could give the boy was to not let him die alone. He gently rocked him until the child died in his arms. Two years later, Coller joined the pediatrics faculty at UCLA Mattel Children’s Hospital, and joined Miller on another medical mission in Peru. He now teaches at the University of Wisconsin. 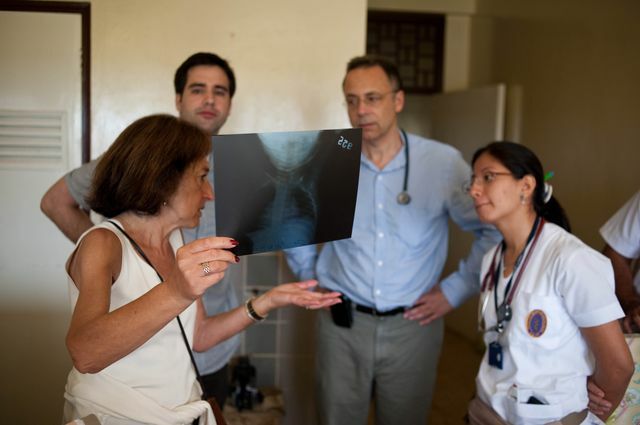 “Global health work offers us a priceless perspective,” Miller said. “It reminds us how fortunate we are to live in a resource-rich country, and what an incredible privilege it is to be a physician.